This personalized address stamp makes a thoughtful token for your favorite couple. A thoughtful token for a couple of newlyweds, a family, or a new homeowner, this personalized stamp celebrates the place you call home. Brandy Schuman custom designs these stamps in her Atlanta, Georgia, studio and then cuts them out of durable red rubber and North American native wood. Your chosen name and address are rendered in a stylish mix of print and script lettering, adding handwritten appeal to ready-to-go writing. 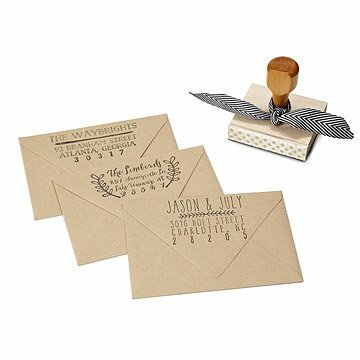 Lending a personal touch and polish to wedding invitations, thank-you notes, luggage tags, and more, this time-saving stamp delivers nostalgic charm wherever you mark your moniker. Made in Atlanta, Georgia. Printmaking gave Brandy the chance to try all sorts of mediums, and in school she explored linocut, screenprinting, textiles, lithography, batik, letterpress, etc. She started making stamps of her drawings as another way of creating patterns for silk scarves and paper projects. Thinking about it now, it seems to her like a natural progression from printmaker to stampmaker. Creatively she's always jotting down ideas and trying new things, and she forgoes excessive planning in favor of a more organic creative process. Some of the best things come from just putting pen or brush to paper and going for it. For Brandy, the thought of something she's created going off into the world and hanging out with its new family is exciting! Can be cleaned with mild dish soap and a toothbrush. Do not submerge in water. Kit includes: custom stamp, black ink pad, 6 kraft cards and envelopes, and muslin bag for safekeeping. It's a great gift for longtime friends. Very personal and stylish, and something they wouldn't already have. It is different from traditional wedding gifts, and for a couple I've been out of touch with for a few years. I heard they were married and wanted to send something unique but not over the top. This gift was perfect. This stamp was exactly as pictured. The stamp itself is clearly well-made and personalized as requested. I love how well-received this gift was to its recipient! My daughter and her fiance are moving into a new home and I thought the stamp would be fun for them to use!